Seed companies play an important role in providing smallholder farmers access to improved seed. CIMMYT’s breeding and seed systems teams have been supporting Afriseed – a brand produced under the flagship of Stewards Globe Limited – to build its product offering and give farmers more options. The company has recently added high-yielding, drought-tolerant maize hybrids (GV635 and GV638) to its portfolio, which includes open-pollinated varieties (OPVs) and legumes such as beans, cowpeas, groundnuts and soybeans. Stewards Globe has received technical assistance through the CIMMYT-led Drought Tolerant Maize for Africa (DTMA) and Sustainable Intensification of Maize-Legume Systems for the Eastern Province of Zambia (SIMLEZA) projects. “We don’t have a breeding program, and we need the partnership until we are big enough to develop one,” said Stephanie Angomwile, the acting chief executive officer at Stewards Globe, which has been working with the Alliance for a Green Revolution in Africa (AGRA) since 2010. Both AGRA and DTMA are funded by the Bill & Melinda Gates Foundation (B&MGF), while SIMLEZA is funded by the United States Agency for International Development (USAID). Afriseed production manager Emma Sekelechi got practical training on seed production and hand-pollination techniques during a visit to the CIMMYT-Harare research station in Zimbabwe, where she learned how to synchronize the flowering dates of the male and female parents. The training is important because the company is now making the transition from growing OPVs to hybrids, and hybrid production needs more technical skills than OPV production does. 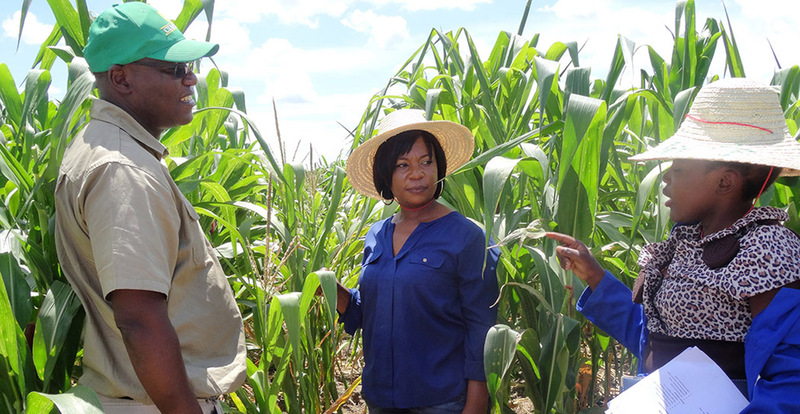 She also attended a weeklong training session for maize technicians held at the Natural Resources Development College (NRDC) in Lusaka, Zambia, supported by DTMA and SIMLEZA projects.